Attorney General Jeff Sessions has been ousted as the top official at the Justice Department, a development that is likely to spark a firestorm of criticism following the midterm elections. President Trump on Wednesday announced that Sessions's chief of staff, Matthew Whitaker, will take over temporarily as his top law enforcement officer. "We are pleased to announce that Matthew G. Whitaker, Chief of Staff to Attorney General Jeff Sessions at the Department of Justice, will become our new Acting Attorney General of the United States. He will serve our Country well," Trump tweeted. "We thank Attorney General Jeff Sessions for his service, and wish him well! A permanent replacement will be nominated at a later date." In his resignation letter, Sessions said he was submitting his resignation at Trump's request. "I have been honored to serve as Attorney General and have worked to implement the law enforcement agenda based on the rule of law that formed a central part of your campaign for the Presidency," Sessions said. The decision punctuates months of criticism by President Trump of his top law enforcement officer over his recusal from the ongoing Russia investigation. 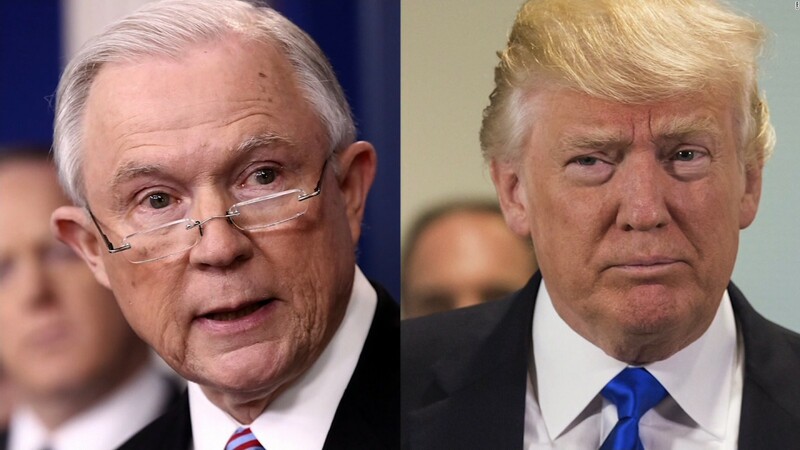 And it confirms widespread speculation that Trump would move to fire Sessions sometime after the midterms. Over the last year, Sessions became a frequent punching back for Trump as he fumes over special counsel Robert Mueller’s investigation into potential collusion between his campaign and Moscow. Trump has repeatedly lashed out at his attorney general over his recusal from the investigation and other alleged failures. The strained relationship appeared to reach a pivotal point in August when Trump in a Fox News interview faulted Sessions for failing to take control of “corruption” at the Justice Department and suggested he had only brought him onto the administration because he demonstrated “loyalty” during the presidential campaign. The episode prompted a rare, public rebuke from Sessions, who in a statement asserted he would not be “improperly influenced” by political pressures. Since, their bond has continued to falter. Trump told Hill.TV in September that he didn’t “have an attorney general” and suggested he was unhappy with Sessions efforts on border security and other matters. The president’s Republican allies, including Sen. Lindsey Graham (R-S.C.), have signaled it would be appropriate for Trump to remove Sessions following the midterms. But the decision could aggravate some Republicans in the Senate and trigger criticism among Democrats and others who view it as an effort to interfere with the Mueller investigation. Despite Republicans maintaining control of the Senate, Trump’s nominee is likely to face a difficult confirmation battle. It is unclear, at this point, who the president may appoint to replace Sessions. The New York Times reported in September that Rosenstein privately discussed secretly recording Trump and recruiting other Cabinet members to invoke the 25thamendment to expel him from office. The report, which Rosenstein has refuted, triggered widespread speculation that the deputy attorney general could be fired or resign. But after a meeting aboard Air Force One in October, Trump said he had no plans to remove him and described their relationship as positive. Trump has acknowledged in recent days that there would likely be a shuffle in his Cabinet after the midterms, though he downplayed it as normal for such changes to occur after an election. "Administrations make changes usually after midterms and probably we'll be right in that category. I think it's very customary," Trump told reporters before leaving fro campaign rally in Ohio Monday afternoon. "For the most part, I love my Cabinet," Trump continued. "We have some really talented people. Look at the deals we're making on trade. Look at the job we've done on so many different things, including foreign affairs. I mean, we've done record-setting work. I don't know that we get the credit for it, but that's OK."
The Trump administration has experienced significant turnover in the two years since Trump’s election, particularly with respect to his national security team. High-level departures have included two national security advisers and, more recently, U.S. ambassador to the United Nations Nikki Haley. Others have been rumored to be on their way out, such as Defense Secretary James Mattis.